A lot of homeowners have an outdated kitchen that hasn’t been upgraded in a decade or fallen out of style. With the emergence of new kitchen design trends that combine style, creativity, and functional design, you can easily upgrade your outdated kitchen into a contemporary one in limitless ways. Contemporary kitchens have a timeless appeal. They exude a subtle elegance with neutral colour schemes, minimalist cabinetry, and metallic accents. Blending modern elements with traditional, industrial and other styles, contemporary kitchens aim to create a sleek yet warm and welcoming space that never goes out of style. 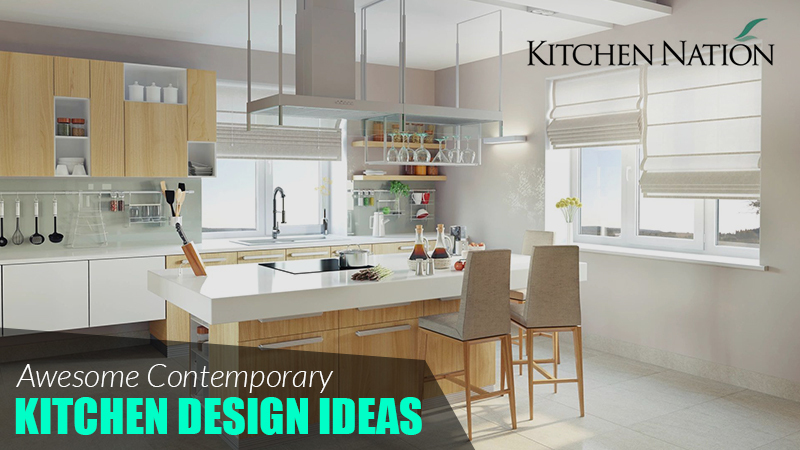 In today’s blog post, we’ll share some awesome contemporary kitchen design ideas to help you create your dream kitchen with the perfect combination of style and function. Natural wood finishes are a returning kitchen trend that can be beautifully included in a contemporary kitchen. They provide a classic and elegant touch to your space. 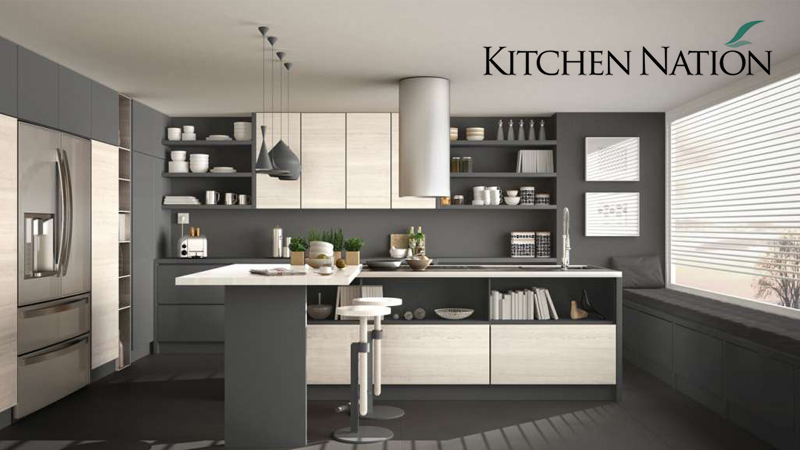 You can opt for wooden cabinets and shelving to design your contemporary kitchen. A well-defined large seating area is one of the features of a contemporary kitchen. If you have a big kitchen, you can create a seating area with a large table and multiple benches made of walnut wood. Wooden elements usually go well with a lustrous white kitchen but you can also consider other modern colour schemes that fit your aesthetic preference. A bright white colour makes your kitchen look cleaner, more spacious, and luxurious. Be it white quartz, quartzite, marble, Corian or high-gloss crystallized glass, you can choose a countertop material that fits your needs and budget. When paired with white cabinets, they can instantly transform your dated kitchen into a contemporary space. This is a good way to give your kitchen a contemporary makeover, especially when you opt for white countertops and cabinetry. A pop of colour can dramatically enhance your contemporary kitchen design. Choose a vibrant colour like turquoise, canary yellow, lime green or bright orange. You can include any of these colours for your kitchen furniture like stools, chairs, tables or for open shelves and kitchen island. The contemporary kitchen style involves the use of metallic accents. Stainless steel is a sleek and modern option to upgrade kitchen hardware (drawer and cabinet pulls, bars or knobs), lighting fixtures (pendant lights, chandeliers, suspended lamps or ceiling lights), kitchen appliances, sink and faucets. You can also selectively incorporate stainless steel accents into your kitchen with range hoods, stools, tables, bars, table bases and open shelves. If you want to add only one stainless steel element in your kitchen to give it a contemporary feel and you don’t have any budget constraint, consider a stainless-steel backsplash. Try out some of these suggestions in your kitchen and give it a contemporary look. If you want to renovate your dated kitchen, contact Kitchen Nation at (905) 595-1211. We have over 20 years of experience in kitchen redesign and renovation. We serve customers across the GTA.